As before, this new test uses our own corporate site, except now the pages use PHP to attach the header and footer. Calls to outside services like analytics were removed to concentrate the test just on this server, and the think time is 4 seconds per page. 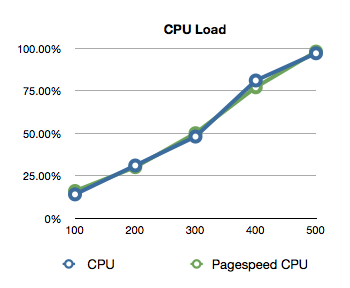 The superficial reason for the performance is CPU load, which starts to consume the server at around 400 users. 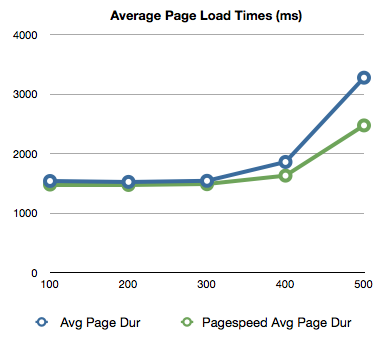 I expected to see that mod_pagespeed added more overhead than running plain PHP. This was clearly not the case, since by around 450 users mod_pagespeed was markedly faster than the default. PHP has never been known for its high performance, which explains PHP accelerators like APC and Zend Optimizer. This is obviously not a comprehensive analysis, so its likely the performance greatly depends on page content. The only way to know what the effects will be on your server is to do a load test and compare.